are rare in today’s business environment. To define the trustworthiness of such electronic signatures the FDA created Title 21 of the Code of Federal Regulations Part 11 which sets the standards and regulations of electronic records and electronic signatures for organizations in bio-technology, medical manufacturing, pharmaceutical, healthcare and other FDA regulated industries. Issued in 1997, Title 21 CFR Part 11 allowed digital records and signatures to be equivalent to their handwritten counterparts while creating official methods that organizations must use to maintain and electronically submit them to the FDA. 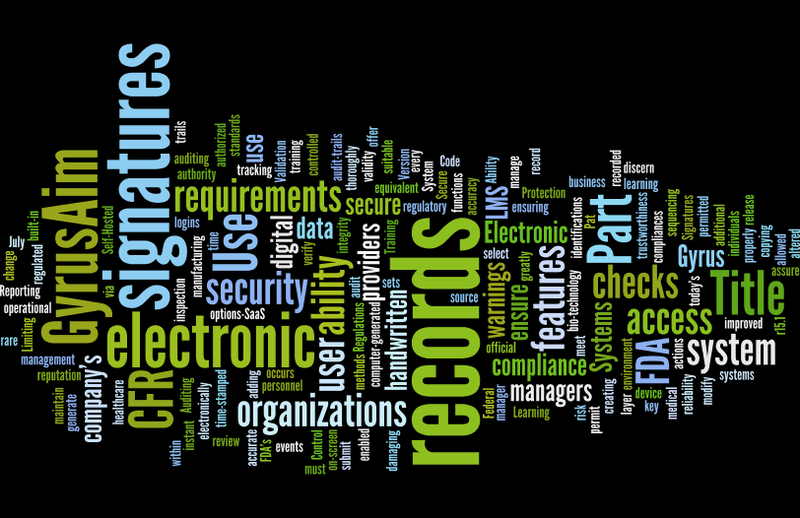 If all electronic records met these requirements then the signatures are officially accepted. Validation to ensure accuracy, reliability, consistent performance and the ability to discern altered records. Ability to generate accurate and complete copies suitable for inspection, review and copying. Limiting system access to unauthorized personnel. Use of secure, computer-generated, and time-stamped audit trails to independently record the date and time of entries and actions that create, modify or delete electronic records. Use of operational systems checks to enforce permitted sequencing of steps and events. Use of authority checks to ensure that only authorized individuals can use the system. Use of device checks to determine the validity of the source of data. Non-compliance during regulatory inspections can risk damaging your company’s integrity and reputation. Only a handful of learning management system (LMS) providers offer organizations the ability to meet the FDA’s Title 21 CFR Part 11 requirements. With the July, 2015 “15.1” release of GyrusAim, Gyrus Systems will be part of this select group of LMS providers. Included in GyrusAim r15.1 are integrated features that thoroughly permit your company’s Title 21 CFR Part 11 compliance. When enabled they assure compliance by adding an additional layer of security tracking and auditing of any change to GyrusAim data. All access and functions within GyrusAim are controlled by user identifications and passwords, ensuring audit-trails are properly recorded for every user. Additional built-in features are included such as on-screen warnings to managers, manager authentication of warnings, instant de-authorization of individual or all user logins by managers when a violation occurs, and more! For more information or to request a demo please visit our website.